NOTE FOR MEDIA: Original material published on SLAVYANGRAD. Provided to us by the author, Ilja Degtjarov. Preamble: As a basic principle we refrain from showing videos in which prisoners of war are questioned. However with this article we make an exception, because the video confirms what the interviewed insurgent states as well in the following text: that the Ukrainian army commits war crimes and buries their own dead in mass graves. So it is worthwhile to read both the text and to watch the video – two completely independent sources. 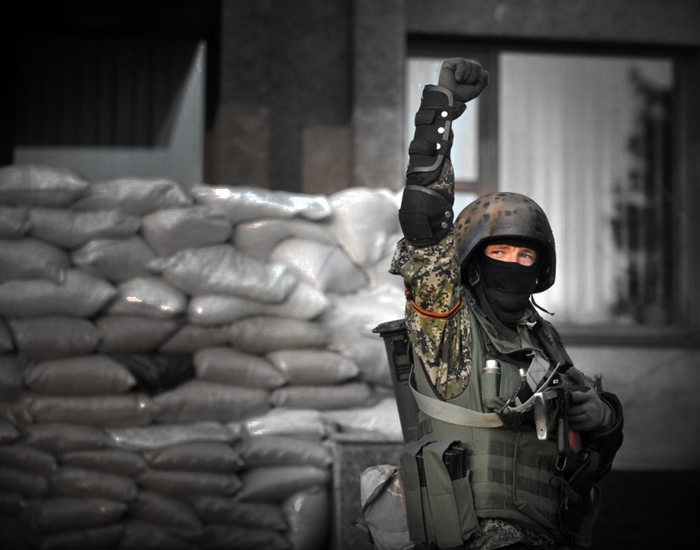 An interview with an insurgent from the Eastern Ukraine. He lives and fights in an area where the Ukrainian army was shattered three weeks ago, close to the Russian border in the Donetsk region. He stayed quiet about his name to me, but he was a wealthy businessman before the war. The interview was recorded mid-August and translated into German directly and from German. Some accuracy might have been lost when the German was translated to English. Why have you become an insurgent? Because I do not agree with this Government and the things that are happening. I do not agree with this attitude towards the people. I could not bear it anymore to watch the people being tormented. Therefore, I have become an insurgent even though I’m already 53 years old. I do not agree that they came into my region. I will protect my trees, my stones, houses, children, women and everything else. Where do you draw your optimism? You fight against the Ukrainian army and thousands of foreign mercenaries. The whole West backs the Ukraine. Why do you remain optimistic that you gain the upper hand? We have a heroic people who have never knelt down. The victory will be ours, and if we still die, then better standing than on our knees. We have our vision, we have something that we want to fight for. Our grandchildren will grow up here. And if we die ourselves, our grandchildren will live as one must live, that is in a free country. 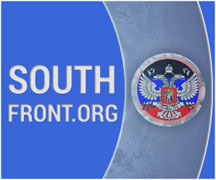 In much of the Western mass media it is reported that in reality the insurgents are composed of Russian special units or parts of the regular Russian army. What do you think? We are not fighting for Russia, we are fighting for our people. Russia is a free country, a country where one can freely live without submissive bows to the United States and the EU. We know how you can live in Russia and we want to live like that as well. We do not want to bow before anyone, or worship anybody. We are a free people. What do you think is wrong with the new Ukrainian Government? What caused this movement in the Donbass region? These people have come to power through blood. Now they want to drown the whole Ukraine in the blood. Although they talk about the “free Ukraine” this country was never free, it always had to be subordinate to someone. Now the Ukraine is knuckling under to the United States of America, a country that suppresses all countries and is inciting wars everywhere. Actually, this country [USA] should be eliminated completely from the Atlas. Well, for the time being we will reach Poland, there we will wash our boots and then we will go on. Back to the previous question: are the insurgents primarily local citizens or are they mostly Russian volunteers or even the nasty Russian army, dressed up with foreign uniforms, as some claim? Insurgents are people who just yesterday were working with a hoe and a spade; who cared for their gardens. Then they laid down their tools and now they protect their gardens with machine guns. We are freedom-loving people. Even women, children and seniors go fight with us. How would you describe the ideology of the people who have come to power in Kiev? In the West they say, of course, that they are flawless Democrats, who simply want to be different than Russians. Would you call them Democrats or perhaps something else? I understand democracy in the way that one can express his will; and not that someone else speaks on your behalf. I still remember how you voted about the separation [of the USSR]: at that time also nobody cared to listen to us. Even now they are pursuing a unilateral policy. They want to see only that, what happens on the other side [in the Western Ukraine]. They are unaware of the suffering of our mothers and fathers. This is not a democracy, but fascism in its worst form. Not even fascists have killed children in this way, destroyed houses, poisoning the land with ecologically dangerous bombs. They bombard us with white phosphorous bombs and cluster munitions. They bombard us with cluster bombs, so that millions of small metal particles fly in all directions and on whole streets, everyone is killed, including women and children. After such bombings nothing is left, not even animals, but only burnt earth. Is this democracy? Do they fight this way for democracy? No, that is fascism. Who fights on the side of the Ukrainian army? What is meant by foreigners? We had prisoners of war from Poland. There are very many foreign instructors, granade launchers. Our [Ukrainian] soldiers do not want to fight, according to the prisoners of war, thus they are threatening them and their families with death. In the Ukrainian army they are even killing wounded. The insurgents, the so-called “terrorists”, have left no one wounded in the lurch. They also help the civilians, the sick, all those in need. So there are actually facts that they retrieved organs, apparently to sell them? Yes. There is someone they can ask about this, can’t they? [ask to another insurgent]. We have people from Kramatorsk, who observed that. Have you seen it with your own eyes? Yes, with my own eyes. (Another insurgent in the background): We cannot reveal our sources. Why, yes! That has been seen even by our reconnaissance. Even prisoners of war confirm this. Bodies were buried with excavators. Apart from the Polish, who else is fighting [against you]? If we link up into their radio conversations, we hear foreign languages. But I don’t know which ones. And the Poles are found everywhere. Why did they come? Are they mercenaries or regular units, sent here by force? These are people, among others, who are even willing to pay to be allowed to hunt people. They pay that they may fire on living people with sniper rifles. If there are no insurgents, they shoot civilians. For example, there was a man driving to work with his bicycle and they have shot off his head just for fun. Do you mean a specific case? Yes, a week ago. The man was completely harmless. A sniper shot him, for fun. (Another insurgent in the background): We’ve seen it, it was a hundred meters away from us. He was just going to work. I have read about such cases, but I have not heard directly of that. Why do the new leaders consider themselves entitled to kill such vast amounts of people? There used to whining all over the world, that allegedly some students on the Maidan were beaten. Now thousands are dying, and nobody cares. Why? Why the double moral standards – what ideology is it? [About] these double standards, I understand the following: Ukraine executes commands from the West, it has no will of its own. Ukraine is eliminating people who are in the way for the coal and gas production of the Americans. They do not need our people here and destroy them therefore, area-wide. It is not a question of eliminating some of us, it is about to annihilate us comprehensively, using Grad [rocket] launchers, mines, surface-to-surface systems [ballistic missiles]. There are bombs, which leave a crater three metres deep and eight metres wide. Within a radius of 300 meters nothing is left alive. Thus, they destroy cities. Women and children are hiding in cellars and they burn them there with flame-throwers and explosives. They do not “only” kill families, but inhabitants of entire apartment buildings. The killing of insurgents’ wives is particularly enjoyed. Is it even possible not to fight against those guys? We are simply obliged to neutralize this contagious infection that is spreading in our country. If we consider the situation realistically: at the end of 2013 the Ukrainian army had about 4,000 armoured cars according to official data. The insurgents have only a few of them, so you cannot compare the forces. This huge mass [the Ukrainian army] is overwhelming and additionally there are these, for example, Polish armored cars. How can you beat this endless mass? They fight for the money or out of fear that their families may be hurt, if they fight badly, or something similar. We fight for the lives of our children, for our country. That is a big difference. They fight without a vision and we have one. This will always win. We do not feed ourselves as well, but our spirit is stronger than theirs. No doubt, we will win because we are fighting for our people, while they came to our region, to take it away from us. Were there cases that the Ukrainian army shelled buses or cars in which were clearly refugees? Several times – even if it was written in large letters [on cars] that there were children. They shot at big crowds before customs houses. They fired at a seven-kilometer queue with grenade launchers and howitzers. People were running in all directions and left their stuff. As a slightly different example, next to the border an alarm system responded very loud at something; the children from the Donetsk region, from Kramatorsk thought that they would soon be bombarded. Which psyche can such children have? What else is the Ukrainian army doing that you definitely do not know in the West? Even people from the Stone Age have not done anything like these people in the 21st century. They torture, they kill people, break arms, cut off fingers, chop off heads and see how long you can still walk without a head. Everything you can imagine as horrible at all, they already do. We speak the same language, we had the same ABC-books at the school, so it is incomprehensible to me, through what influence they became the way they are. Can you give specific examples? Without a name. They shot at refugees, i.e. people who are already scared, with grenade launchers; with machine guns as in a shooting gallery, if people were clearly visible on a street. They did not shot to warn, but to kill. By the side of the road cars are lying around and they [Ukrainian army] do not allow the bodies to be picked up. Accordingly it smelled noisome due to decomposition of the bodies. Only after the liberation of the area the corpses could be removed. So they are fighting so against children, against women; and yet once they see armed men they lay down their arms and surrender with a white flag. Regarding Boeing [MH17]: In the West it was proclaimed immediately – without ifs and buts – that the insurgents shot down the aircraft. [They said] Putin had given both the money and the BUK [missile] system, so Putin is to blame personally. Anything you can say? I know nothing about that, but it is clear that the insurgents would never shoot down an airliner. Insurgents are fighting for people’s lives and it is unimaginable to save people with one hand and to execute people with the other hand. Were there cases, where the Ukrainian army shelled towns and villages, when there was no insurgency at all? This is their action model: first they use mines and missiles and then they penetrate into the cities. First they destroy and then they begin to “protect” the destroyed. They destroy absolutely everything. They destroy the people as one chops down a forest. They do not care whether it’s women or children, disabled people in wheelchairs, no matter whether there are insurgents in the city or not. What use is it to shoot peaceful cities and civilians? What do they want to achieve with this? We have here the city of Molodogwardejsk. Although there are no rebels at all, this town has been destroyed from a safe distance with howitzers. For them it is simply to destroy cities and leave a desert. Why do they do it, you have to ask them yourself. In the meantime we can now not even trust their white flag. Under the white flag, they perform regrouping of their forces and then begin to shoot again. You can no longer trust them – neither the army nor the Government. This is scum of humanity. When you look at their resumes, it becomes clear that they belong in a zoo. Until they sit in cages, children don’t have to be afraid of them any more. That would be my only wish. How can you explain that even in some areas of the South East [of Ukraine] the junta has currently de facto won, for example, in Dnepropetrovsk? Why have large parts of the population changed sides ideologically? Why isn’t there any significant resistance? Our country is poor. At first poor people earned from participating at the Maidan. You just went there [to Kiev] to earn the money. There it took people, to create large crowds – I would say herds of people. There they were given drugs, e.g. in tea. By the way, after their return home they have detected withdrawal symptoms in them. In addition, they received a brainwashing at Maidan. And only the people from Donbass were not going there; they had to work in this industrial area, they had to earn the money for the whole country, feeding the country. Therefore they still cannot subdue us. We have endured it as long as we could it. But at some point we could not any longer, which led to the uprising. It was always so in Russia: they harness slowly, but they ride fast. What will happen with these cities [outside of the Donbass] now? Certainly one can assume that the vast majority of them are also against the Kiev Government, but this majority is suppressed and stays silent. But in my opinion, they should also liberated, otherwise they will be taken sooner or later, so that they support the junta. Then they are lost forever. But we will liberate these towns as well. We will not punish anyone; everybody can have his own opinion. We will present our point of view, but will not impose our opinion. If someone wants to follow us, just go ahead, but if not, then not. Then they can simply go to lead their lives, to work. It is summer. It is still warm and the streets are well passable. But in winter it is cold, un-asphalted roads will become impassable dirt, so that you can hardly deliver humanitarian aid from Russia. In many cities there is now no electricity, no water, no heating. How will you survive then? We are a strong people. We are used to difficulties. And we will overcome these obstructions as well, whether in rain or snowstorms. We are serious about what we have started, and we will not stop now just like that. We will fight to the end, there is no way back. Is there evidence that Americans sit in the military administration and give orders? I can say nothing about that. Everyone makes his task here and since I’m not a scout I am not able to answer the question. To what extent does the local population support the insurgents: Is it 95%, 70%, 50%? You can judge for yourself: people harvest potatoes and give us some of it. People harvest three tomatoes in the garden and give us two of them. If we look back to the times when there were no armed insurgents, but the junta had already proceeded disproportionately; how did people fight against them back then? They fought with sticks against machine guns. They quit their jobs, left their families and came to us from everywhere. This concerned those as well, who did ignore the whole thing. Meanwhile, they changed their mind and protected their country. Many changed their bad habits, abstaining from alcohol. Among the insurgents, generally, iron discipline reigns and it is strictly forbidden to drink alcohol. The people are not paid. They fight for an idea. They eat what they are given from the civilians. All are highly motivated, but the sooner the whole thing comes to an end, the better. The Ukrainian police fought for 23 years against such phenomena as corruption and drugs, but without success. We have fixed it immediately. Drugs have become the absolute rarity. Something is changing in people’s minds and even alcoholics and drug addicts are changing their habits. In our shops you can buy vodka easily, but nobody does. Addicts tell themselves – maybe as a joke – that they will take no more drugs before victory. Anyway, there are no more drugs. Within the liberated towns, factories and coal mines are destroyed; there is no work. How can you live there? We will rebuild it, as we did after the Great Patriotic War. Our enthusiasm will be enough for that. Even if our generation will live in poverty, the next generation will live better. We are not afraid. From the Russian side you receive humanitarian aid, which is generally known. But who delivers this assistance: the State, any parties, the church, private individuals? You have access to these packages. Take pictures, the packages are labeled. Also from veterans of the Afghan war, by Chernobyl veterans, by the Communist Party, from the people who know what a war is like. Do western organizations also provide humanitarian assistance in South-East? And how! They deliver mines and projectiles for the Ukrainian army. In this way they help the Ukraine and this assistance helps then to destroy normal people. So, there is no real humanitarian aid [from the West]? It does not exist, I’ve never seen any. The same applies for medical help. could you please give more details about polish POWs? video would be good where they confirm their identity and why were they sent there. Lots of people in Poland is against us (Poles) taking part in this war. There would be huge affair about those mercenaries. Regards, keep up good fight! These are stunning testimonies. Thank you for the translation and the subtitled video. Kiev, burying alive their wounded sons. Criminality of the highest order. Inhumanity of the highest order. And the courage of the people of Novorossiya, fighting against enormous odds for simple gardens and tranquility. All this carnage on the orders of Washington, Brussels and Satan.